President Obama has occasionally drawn fire from the left for his appreciation for right-winger Ronald Reagan. In the coming days, Obama is set to expand upon the Reagan legacy through the entry into force of a free trade agreement (FTA) with Panama. This is nearly 30 years to the day after the Reagan administration signed a “bilateral investment treaty” (BIT) with Panama. That October 27, 1982 signing was a first for the U.S., and included many of the rights for foreign investors that are expanded upon in Obama’s latest trade deal. 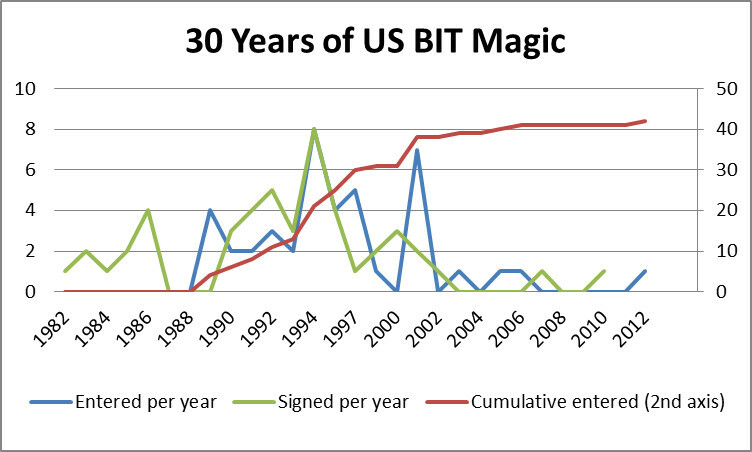 The U.S. has since signed 48 BITs, and implemented 42 – most recently with Rwanda. The table below shows the total signed and implemented by year (on the left axis), and cumulative implemented on the right axis. The U.S. Senate, which is required to give its advice and consent to BITs, has handled these treaties in tranches. On October 20, 1988, the Senate approved BITs with Bangladesh, Cameroon, Egypt, Grenada, Morocco, Senegal, Turkey and Zaire. On August 11, 1992, the Senate greenlit pacts with Congo (previously Zaire), Sri Lanka, Tunisia, and the Czech and Slovak Republics. On October 21, 1993, a BIT with Kazakhstan went through, followed on November 17 of the same year by Argentina, Romania, Armenia, Bulgaria, Kyrgyzstan, Moldova, and Ecuador. On June 27, 1996, BITs with Jamaica, Ukraine, Georgia, Estonia, Latvia, Trinidad & Tobago, Mongolia and Albania were approved. On October 20, 2000, the Senate OK’d BITs with Honduras, Croatia, Jordan, Azerbaijan, Lithuania, Bolivia, Mozambique and Bahrain, along with an amendment to the Panama deal. Additionally, BITs with Haiti, Russia, Belarus, Uzbekistan, Nicaragua and El Salvador were signed but never implemented. Recent years have seen much less action on the BIT front, with only deals with Uruguay (2006) and Rwanda (2011) getting Senate advice and consent. This isn’t a sign of declining enthusiasm for the terms of these deals: it’s just a change of preferred instrument. FTAs hogged most of the attention during the Bush II and Obama years: trade deals with BITs-like chapters within them were approved by both House and Senate in 2003 (Chile and Singapore), 2004 (Morocco and Australia), 2005 (CAFTA, with six nations including the aforementioned Honduras), 2006 (Oman), 2007 (Peru), and 2011 (Korea, Colombia, and yes, Panama). This adds to the deal that got probably the most attention of all – NAFTA with Mexico and Canada in 1993. This adds up to 55 54 countries that have implemented US BITs or FTAs. And more are in the works, including through a Trans-Pacific Partnership and possible BITs with China and India. Next Post I can haz navy?